WE would first like to say that the purpose of this article is not to offend any people or denomination. This article was put together to make sincere, honest, truth seeking people aware. There are no doubt millions of people in the Roman Catholic Church that are not aware of the changes below and that is no reflection on their faith or love for Christ. You will find below the very shocking table that shows the Ten Commandments as personally spoken and written by God using the King James translation Exodus 20:2-17 and the Ten Commandments as changed by the Roman Catholic Church in the Catechism of the Catholic Church. The Roman Catholic Church believes that their authority stands above the Word of God and that they can change God's times and laws and God will accept their changes. You should note that they actually deleted out the second Commandment and also changed the Biblical fourth Commandment from God's Sabbath to Sunday. They also split the tenth Commandment into two to get back to Ten Commandments. 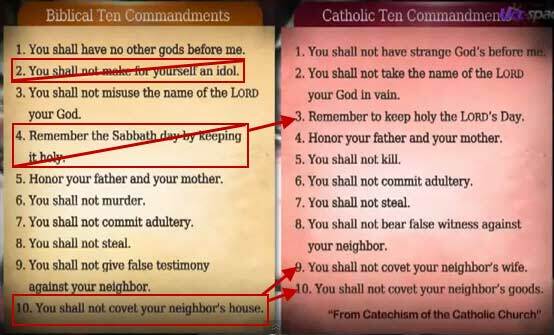 As a result, the Roman Catholic version of the Ten Commandment is always one ahead of the King James in the Decalogue until you get to the tenth Commandment which they break into two and make it the ninth and tenth Commandments. Please take note that the Catholic Encyclopedia Volume 4, p. 152 confirms the deletion of the second Commandment and the change of the fourth commandment. They do not try to hide it, but are actually proud of it! "The church, after changing the day of rest from the Jewish Sabbath of the seventh day of the week to the first, made the third commandment refer to Sunday as the day to be kept holy as the Lord's Day." Please do not take our word on this most important subject. We ask you to study this out for yourselves. You can do your own internet search and find many Catholic websites confirming what we are showing you here. It is all out in the open. Is is very important that you know the truth don't you think?